Mary received her first set of knitting needles and yarn at the age of 12. She has been in love with the art ever sense. She has taught for Little Falls Minnesota community education and currently teaches knitting classes and techniques at the Old Creamery and Yarn Shop in Randall Minnesota, along with yarn dying and pattern writing. Candace brings a background of teaching science and art to her classes. She has done painting and sculpture, and applies the skills learned to working with wool- it really is a wonderful media to work with. 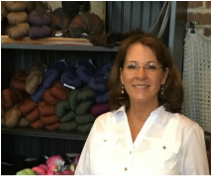 This will be her third year working at the Fosston Fiber Festival. She also teaches felting classes at libraries, and for 4-H groups.